SONGS hold powerful memories and are one of the best dementia therapies. See how one home is realizing the potential of music to treat Alzheimer's. Music using YouTube is part of our daily routine in our own home. My wife loves to sing along to the songs her dad sang to her. She is also a great fan of severla musicals South Pacific is her favourite and she knows them all even the French songs. Yesterday she sang along so beautifully to Evita I wished I had recorded her! 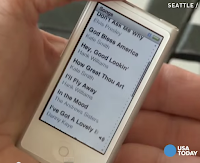 In an empirical observation,tablets works too very well, or actually better than Ipods, in any type or stage of dementias,as tools to helps to improves cognition,mood and behavior disorders in dementias, including helping in sundowning,agitation,apathy,etc.When the caregiver puts a video (in youtube,for example) with an OLD music that the patient likes,and if the video has too beatiful photos of a calm sea,forest,or a sunset,images of small pets,etc.,this association that the videos gives,between the music and beatiful picturea,really gives pleasure to dementia patients.It is amazing how they put their focus in the videos,even if they are with sime pain, or agitated,or confuse,they stops and focus in the videos.Evrry patient could see some videos twice a day, for a better quality of life.